Day eight of the US Olympic Trials was met by heavy rain, a slippery track and determined athletes in pursuit of making it to the homestretch of this ten-day competition. Some refused to walk away defeated while others ended their quest on the road to Rio. 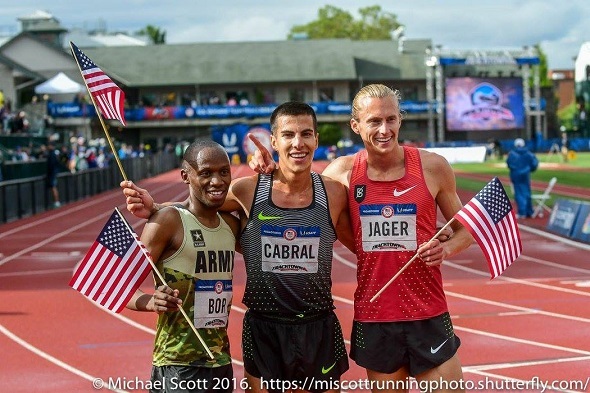 Donn Cabral (Princeton ’12) earned a spot on the Olympic team in the men’s 3000m steeplechase with his time of 8:26.37. There was plenty of movement in this final as US leader Evan Jagger moved to the front of the field on the fourth lap. With just the last water jump remaining Cabral was holding onto fourth place nearly a second behind Stanley Kebenei and Andrew Bayer who were second and third. Kebenei’s unpredicted spill over the last barrier and Bayer’s stumble gave Cabral and Hillary Bor the window they were looking for to move up and fill the final spots on the team. Evan Jager won the race. Cabral admitted after the race that it was not his best race and he felt a bit weak over the final 600m, but he admits he was “lucky” to earn a spot for his second Olympic Team. In her stronger event, Gabrielle Thomas (Harvard ’19) completed a successful first round of the women’s 200m. Thomas took full advantage of being assigned one of the preferred lanes in this event as she broke stagger fairly early and ran down the professionals in her heat to win in 22.91, which has qualified her for the next round on Saturday at 8:03 p.m. She is currently ranked third going into the semi-finals behind professionals Jenna Prandini and Tori Bowie. Former teammate Autumne Franklin (Harvard ’16) battled her way to the final round of the women’s 400m hurdles after the NCAA champion, world leader and event favorite Shamier Little failed to qualify. Franklin kept her composure off the last two hurdles maintaining her form despite the pouring rain and fatigue. She will enter the final with her 55.40 mark, which puts her third going into the last race Sunday at 7:03 p.m. The clouds held back the rain for the women’s 1500m semi-final round where Morgan Uceny (Cornell ’07) ran a strategically sound race that will move her to the finals on the last day of competition. In the first 700m Uceny sat comfortably in ninth. At 1100m Uceny’s patient wait was up as she improved her position to second before taking a brief lead with less than 300m to go. Brenda Martinez quickly took over the race using her 800m speed to challenge her heat in the last 200m. Uceny responded with a full out sprint to the finish running 62.88 for her last lap. Her 4:11.64 has advanced her to the next round on Sunday at 8 p.m. The men’s semi-final round of the 1500m was run at a relaxed pace for the competitors in the two qualifying heats. Johnny Gregorek (Columbia ’14) finished eighth in his heat with a time of 3:45.59, which will push him through to the finals. Kyle Merber (Columbia ’12) will also run in the 12- man final after finishing fourth in his heat and clocking 3:48.30. Thomas Awad (Penn ’16) did not advance to the next round as he ran 3:55.36. On his final attempt, Justin Frick (Princeton ’10) cleared the bar at 2.14m (7-0 1/4) to make it to the men’s high jump final. Garrett Huyler (Cornell ’09) was one of several athletes unable to gain a successful clearance over the wet bar and onto the drenched mat. His no height was one of 12 during the qualifying round. The final will take place Sunday at 6 p.m.
Sam Mattis (Penn ’16) also found himself struggling to launch a discus that would equal his PR and challenge the top three leaders. His first throw, 57.86m (189-10), was his furthest throw of the final— finishing ninth overall in the competition, less than 1 foot away from getting the additional three throws. This entry was posted on Saturday, July 9th, 2016 at 7:01 am. It is filed under Olympics, Spotlight. You can follow any responses to this entry through the RSS 2.0 feed.